Huawei has released E5186 4G LTE Cat6 CPE Router along with E5786 Mobile WiFi router in the market as the successor of Huawei B593. 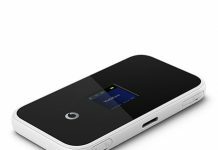 Vodafone is already started selling Huawei E5186 gateway as Vodafone B4000 and Max Wireless of Germany is also planning to sell the same. Presently two models of Huawei E5186 : E5186s-61a and E5186s-22a. 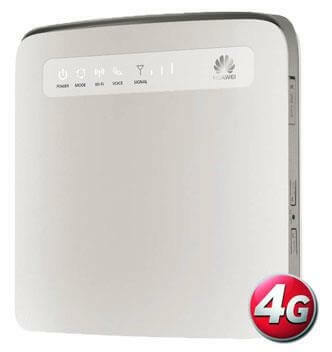 Huawei E5186s-61a supports LTE FDD 700/1800/2600MHz TDD 2300Mhz, DC-PA+/HSPA+/UMTS 900/2100MHz and GSM/GPRS/EDGE 850/900/1800/1900MHz operating frequency bands. However, Huawei E5186s-22a comes with 4G LTE FDD 800/900/1800/2100/2600MHz, 4G LTE TDD 2600MHz, 3G UMTS/WCDMA 2100/900Mhz and 2G GPRS/GSM/EDGE 850/900/1800/1900 MHz frequency bands supported. This Cat 6 LTE router is capable to download a file with maximum speed upto 300Mbps, while upload speed limit is 150Mbps in 4G/LTE FDD network. In 4G/TD-LTE, download speed is 224Mbps, and upload is 20Mbit/s. It supports WiFi 802.11b/g/n/ac, 2.4GHz/5GHz and can connect wirelessly up to 64 devices. Build with Hi-silicon chipset, device has 2 External antenna ports (SMA female). The E5186 boast a memory card slot also, can be upgraded with up to 32GB of microSD card. 2 X 2 MIMO, USB 2.0 for host sharing and Printer, 4 x RJ-45 Ethernet Port (One for WLAN/LAN, Three for LAN), 2 x RJ-11 for Analog Telephone, Firewall, CS Voice, VoIP, VoLTE, TR069 Remote Management, HTTP Online Upgrade, QoS, USB Share, UPnP, IPV6, DLNA, Fax, Print and VPN are additional features of this gateway. Huawei E5186 measures 194 x 177 x 64 mm dimensions, while weight is 450gm. It can be used with Windows/Linux/Mac OS. Presently its market price is apprx $500 (Roughly Rs 33,500). Unlock code charge is for E5186 router is 6 USD, detailed procedure will be mentioned in next article.